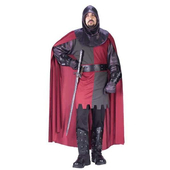 Size: Medium: Chest Size 38" - 40" Large: Chest Size 42" - 44" X-Large: Chest Size 46" - 48" 2X Large: Chest size 50" - 52"
Noble Knight Costume includes a maroon tunic with printed emblem on the front. 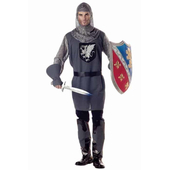 Top has attached sleeves and collar with a chain mail look, black belt with functioning buckle, and grey boot covers. 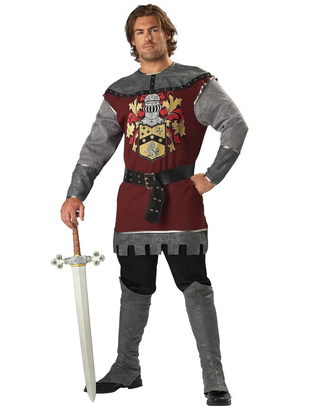 Sword and pants not included. 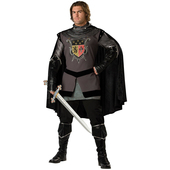 X-Large: Chest size 46" - 48"
2X Large: Chest size 50" - 52"
3X Large: Chest size 54" - 56"